Windows Update Error 80080005 is one of the most common errors that you may face while updating your Windows. When you try to install an update on your Windows computer, you may encounter with this error 0x80080005. There can be many reasons which are responsible for this error code. But as the performance of your Windows OS and your computer in general immensely depends on this update, it is ought to be fixed as soon as possible. Your Microsoft Security Essential-related program file or Windows system file might get corrupted due to malware or the virus infection. In case you have deleted the Microsoft Security Essential-related program file by mistake. When you upgrade the system from Windows 8.1 to Windows 10 you may encounter with this issue. There could be some internal application conflict and due to that, you are facing the update error 8008005. So, if you are also getting a similar type of error this article will help you to fix that. You just need to follow some simple troubleshooting steps and the problem will be resolved. You have to press the Windows logo key and letter X key together in order to get the Power user menu and after that, you need to select Command Prompt(Admin). A black window will pop up on your computer screen where you need to type SFC/scannow and then press the enter button through the keyboard. This tool will find out if there are any corrupted files. And if the files get detected this tool will also fix that issue. Once this process gets completed you need to reboot your computer operating system. You should install.Net Framework 3.5 in order to fix the Windows Update Error 80080005. Press the Windows logo key and the R key together in order to get the run box on your computer screen. You will get to see a white panel where you can type in. Type “appwiz.cpl” and then click OK.
Now select Windows features on or off. Next, select the box.Net Framework 3.5 and then hit on the OK button. You will get to see an option name Download files from Windows Update. You have to select that option. Try to update Windows again. You have to download the SSU which is the Service Stack Update. It will assist you to resolve this issue. But before you download that, you need to ensure that whether you are using the 32 bit or 64 bit Windows. First, you need to hit on the start option then choose the setting option. You have to select the system option. You need to look for System Type. The SSU version should matches your version of from the Microsoft Update Catalog. Once you download that, you need to restart your system in order to check the updates. There might be some registry key which might create this issue. So, to fix this error 0x80080005 you should remove that registry key. Press the Windows logo key and the letter R key together at the same time. A small Run box will appear on your computer screen. There will be a white panel where you can type in. Make that panel empty and the type regedit and then, press the Enter button through the keyboard. Type regedit and press the Enter through the keyboard. After that, you need to reboot your computer and the problem will be resolved. The third party antivirus might prevent the Windows update file from downloading. In order to fix this issue you need to disable some features of your antivirus or completely you can disable the antivirus. In case you face the issue after disabling your antivirus, you should go ahead and turn off your antivirus. You have to press the Windows logo key and the I key in order to open the Settings app. Go to the Update and Security section from the menu which is on the left pane. In the right pane, you will get to see an option Windows Update. Select that option and after that click on Run the troubleshooter. Follow the on-screen command in order to complete the troubleshooter process. Press the Windows logo key and the R key at the same time. A small run box will appear on your computer screen. You will get to see a white panel where you can type in. Type services.msc, press the Enter button through the keyboard. A service window will come up on your computer screen. You should look for the Windows Update service. Give a double click on this option to open the properties. You will get to see Startup type option. Select the Disable option and then click Apply and then hit OK to save changes. After that, you need to restart your system. Once your PC booted up, go back to Services window. You should open the Windows update service properties. Now you have to set Startup Type to Automatic and start the services. After that the will be resolved completely. You should download the Media Creation Tool. In the system partition, you have to make some spaces. There will be a Run option which comes up on your screen. Hit on that option and then select Upgrade this PC now. Once the Windows 10 get downloaded successfully accept the license agreement. Wait for sometimes so that the Update will download the required files. Once it gets completed you need to select Download and install updates. The hit on next button in order to proceed further. Let the system the way it is as the downloading and installing will take sometimes. You have to click on Change what to keep and then choose to Keep personal files and apps option. Then give a click on the Next button and then follow the on-screen instruction in order to complete the installation. Once the installation process gets completed your system will be updated with the latest version of Windows and the issue will also be resolved. You have to click on the Windows button first and then select the Command Prompt(Admin). You should be logged in to an administrator. Note: This will take to get completed. After that, you need to type the command sfc/scannow and then hit the Enter button from the keyboard. This will also take some time. Once you are done close the command prompt and then again the Windows Update again. Give a click on the Start option. Now click on Control Panel, and then select Administrative Tools. A window will come up on your computer screen, you have to click on services and then right-click on Windows Update and select the Stop option. Choose the drive where the operating system is installed and the hit on Windows file. Search for SoftwareDistribution. Once you get that option rename that as SoftwareDistribution.Coopoint.bak. Again you have to go to the Service Window, give a right-click on Windows Update and the hit on the Start option. Now you have to right-click on Windows Update and choose the properties. Change the Startup type option as Automatic. After that, you need to reboot your computer operating system and then install the update again. 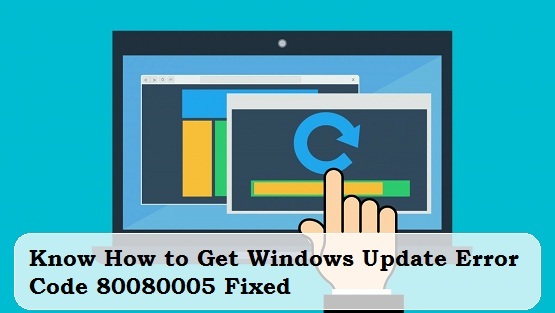 Now, you will a clear concept about the Windows update error 80080005 and why you encounter this issue. We have explained the most applicable troubleshooting steps which will help you to fix this error. In case you face any such troubles, you can let us know by your comments. You can write revert to us by typing your voice in our comment box.